Archaeologists digging up the past in the southern province of Isparta are slowly revealing an ancient city whose well-developed sense of urban planning seems to have served as a model for subsequent conurbations. 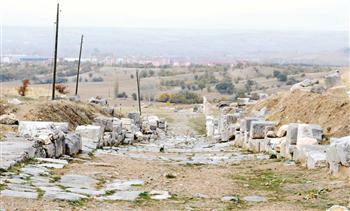 “The ancient city [of Pisidia Antiocheia] is positioned on two main rectangular streets that cut each other vertically, which is called Hippodamic town planning,” the head of the excavations at the ancient city and the head of the Archaeology Department of Süleyman Demirel University, Mehmet Özhanlı, recently told Anatolia news agency, adding that it was positioned on a slope overlooking the west. “Aqueducts were also established in the city to meet water needs. The city was established on seven hills just like Istanbul. The temple of the city’s greatest god was built on the highest hill. The main streets of the city intersect on a north-south, east-west basis. Public buildings were built at certain points on these streets,” he said. Hippodamic town planning was subsequently deployed in the construction of cities in Europe and the Americas. Özhanlı said Pisidia Antiocheia was one of the largest cities in the era and added that it had been constructed with regards to the origin of possible enemy attacks, agricultural and stock breeding areas, water resources and wind direction. The professor also said they had discovered two-meter-deep sewage system under all the streets in the city. Pisidia Antiocheia also featured a stadium with a capacity of 15,000, as well as a temple, an assembly building and other public buildings. “All these are necessary for a place to be recognized as a city in the ancient era. We have so far unearthed them, even though we have excavated only 5 percent of the city,” he said. “We believe that our excavations will make great contributions to Turkey’s cultural and structural value in the next 10 years,” the professor said.